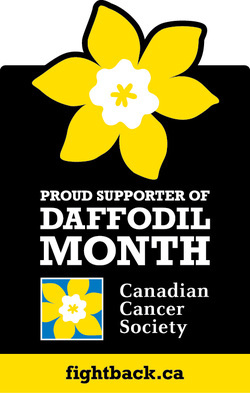 Canadian Cancer Society's Daffodil Month through the Desserts & Daffodils initiative. On Sunday, April 20 & 27, 2014 at the Baker's Market in Vancouver, BC, J'adore les Macarons will donate the full purchase price of $2 to the Canadian Cancer Society with every Meyer Lemon Macaron purchased. You'll also have the opportunity to buy Daffodil Pins for a small donation. We hope that you'll come out to support this very worthy cause. Click here to read more about the Desserts & Daffodils initiative.